RuneQuest Con Down Under III | RPG Review Cooperative, Inc.
Organised by RPG Review Cooperative Inc (http://rpgreview.net) and sponsored by Chaosium Inc ((http://chaosium.com/). Special thanks to John Hughes for his awesome poster and banner. And yes, of course we have a Facebook group. Susan O'Brien, Chaosium's board games line editor, will be attending RQ Con Down Under III. Susan created the two-time Gold ENnie awarding game Khan of Khans with legendary German designer Reiner Knizia, and "Grand Shaman of Games" Greg Stafford. In 'Khan of Khans' each play is khans of the great tribes of Prax with unique special abilities. In spring, as the grasses become green and the rivers swell, the khans lead raiders into the rich lands of Dragon Pass, ripe for plunder. The High Priestess has decreed whichever khan brings back the most cattle from Dragon Pass will be declared “Khan of Khans”, the greatest warlord of the Wastelands! Players take turns to raid different locations, drawing cards from 10 different stacks. The player with the most cows—including those in corrals and in their herd—at the end of the game is the winner and acclaimed "Khan of Khans". Susan will be running tutorial on the game throughout the Con, will have copies of the game to sell (and sign), and there will be a grand knock-out tournament to see who is the "Khan of Khans"! Bringing small humans to RQ Con Down Under? It makes sense, after all Kyral Castle is a favourite locations for the little people to enjoy themselves with the wizard's potion making, the jousting, the children's knight school, the maze, and so forth. Registration for children depends on age and what they are eating. If they are under 4 years old usually parents bring their own food for them. In which case they are FREE, or $30 if they are having the children's menu for the dinner and the lunch. 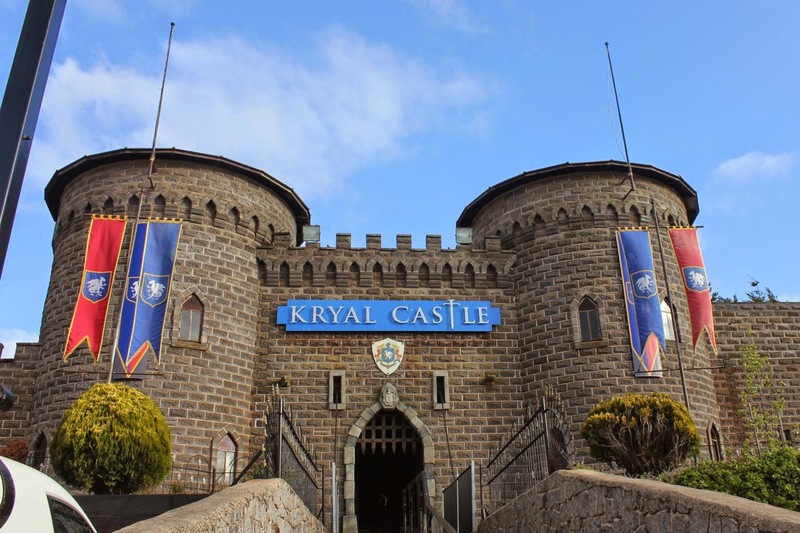 If they are aged between 4 and 12, it is assumed that they will be having the children's menu for the dinner and conference lunch and will be able to participate more fully in the Kryal Castle events - in which case they less than half-price, i.e., $50. In the fine tradition of many other RuneQuest and Glorantha Conventions around the world, RQ Con DownUnder III will host a live action trollball tournament! The game is very simple; two teams of five face each other off and try to carry a trollkin (whole) across the opponents line. Trollkin tend to fall apart (especially when they're a plush toy with velcro limbs), so this is more challenging than it sounds. Players are armed with 1-H Mace weapons specially enchanted not to cause harm (i.e., foam noodle). RQ hit location rules apply. If you're hit in the arm, it drops and is useless. If you're struck in the leg the leg is useless. In the abdomen, you fall to the ground but can drag yourself about. A chest or head hit incapacitates. However there will be a six-breasted Xiola Umbar healer who will have magical Holy Water who can cure any so afflicted. Attacking the healer is not on and will result in everyone attacking the offending player (who will not be healed). There will be a giant referee, who will kick cheating players off the field. Of course, the referee *could* be bribed. But what do you bribe a referee with? The referee is also responsible for recovering the trollkin if it goes off field, falls apart etc. Unlike other Trollball tournaments this one is very special as it involves two troll teams and two Sun Dome teams! A special event following the Hill of Gold HeroQuest led by Praxelites where Zorak Zoran and Yelmalio now have come to a special agreement that on one day a year they are friendly towards each other. The Yelmalio will wear Rabbit Ears from Rabbit Hat Farm. The RQ Glorantha Con DownUnder III Trollball tournament will be held just before dinner (i.e., it is *not* part of Day Tickets) at Twilight, representing the time where Light and Darkness are found together. Update The world is a strange a wonderful and strange thing with moments of great serendipity... We have acquired genuine HOLY WATER for the Xiola Umbar priestess to heal wounds in the Trollball game. The RuneQuest Glorantha Con Down Under Programme consists of three steams; Lecture, Game, and Castle. This programme is subject to change and will be updated as the day of the Convention progresses. But we have some anyway. 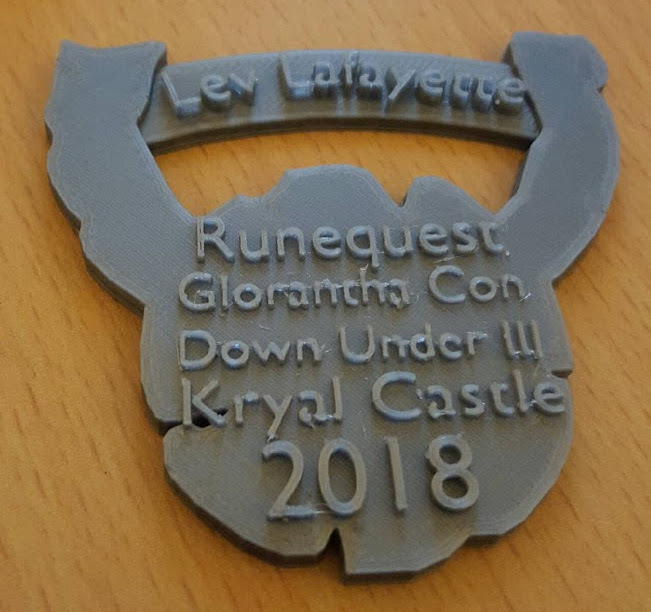 Courtesy of the epic 3-D printing skills of Daniel Tosello, the boring days of lanyards with id pockets and QR codes will not happen at our glorious convention! No, we have Chaos Runes, with your name (or nom-de-Glorantha) proudly displayed. The following is the prototype. The badge on the day will be coloured and you must contact us by close of registration on November 4 (at the very latest) if you want something other than your registered name on the badge. It is also very handy if you tell us now if you're happy with using your registered name. The RPG Review Cooperative, with an endorsement from Chaosium, will be establishing a trust fund for future RuneQuest Glorantha Down Under Conventions. 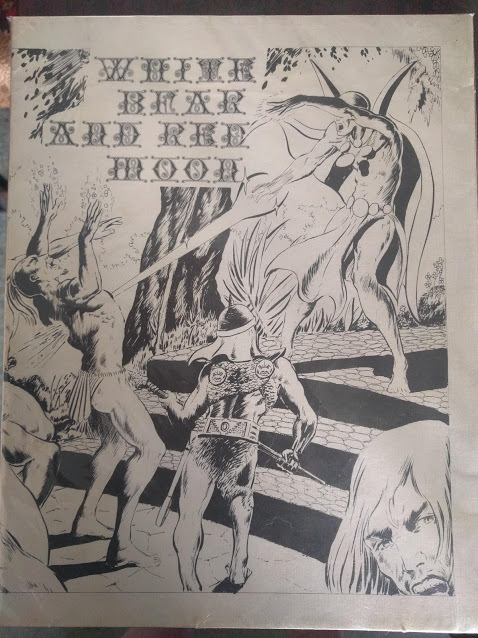 This fund will be established in memory of Greg Stafford and will receive initial funds from the auction of a first edition, first print, of White Bear Red Moon, donated for this purpose. Only eight hundred copies of this game were produced in 1975 and they were hand-stapled by Greg Stafford. Of all the auction items available for RuneQuest Glorantha Down Under III this is the only item for which external bids will be accepted. Potential buyers will be allowed to put in secret pre-auction bids for lots. Send an email to rqduauction@rpgreview.net with your name and bid amount (in AUD). This email will not be viewed prior to the day of the auction.